Training and behavior go hand in hand. If you give your Cocker Spaniel training from an early age, as well as setting him some guidelines and boundaries, you'll be able to watch your puppy grow up to be a well-mannered dog without behavioral problems. Training and behavior, the two are inextricably linked. A well behaved Cocker Spaniel - training at its best! Good training leads to good behavior; if your Cocker Spaniel is well-trained, it's likely that he's also well-behaved. We teach our children the difference between right and wrong, what is acceptable behavior and what isn't, so why shouldn't we do the same for our pets? Unfortunately, many Cocker Spaniels end up being put into shelters (or sadly worse) because their owners couldn't handle them. And yet, it's often so unnecessary because an understanding of how your dog learns and a little training would have made all the difference. Hands up all those who want a happy, well-trained, well-behaved Cocker Spaniel! Wow, a sea of hands! There are many types of training that you can give your dog which will help him live happily in our domesticated world, and which will also help him to grow up without any behavioral problems. Giving your Cocker Spaniel training as soon as you bring him home is the best place to start. It's never too early to begin his training. Teaching your puppy obedience will give him control, good manners and will ultimately lead to a well-behaved Cocker Spaniel. But obedience training doesn't (and shouldn't) stop there. Once learned, obedience commands must be practised many times each day, and in different situations and environments, to help reinforce his training. play a game with him (hide and seek is Max's favorite). Each time you give your puppy a command and he responds, you're strengthening that command. Eventually, your dog will automatically sit before he's fed or his lead is attached to his collar. You won't even need to ask him! Here's a link to my Cocker Spaniel training for puppies page. You'll find all you need to teach your puppy to sit, stand, lie down, wait, stay, etc; in fact, all the basic commands your pup (or dog) will ever need! And if you need some tips on how to approach your puppy's training, just follow this link. Just remember, training should be fun for you both. Take a look at this well-trained Cocker Spaniel and see just how happy he is to be going through his training paces! Contrary to popular belief, alpha dog training isn't about fear and intimidation. It's about setting ground rules for your Cocker Spaniel (in the same way we do for our kids) to help your pet understand his place in your pack and respect you as his leader. Alpha training is about establishing boundaries and building a strong, positive relationship with your dog. It's about helping your Cocker to become a respected and loved member of your family. If you find yourself having to toilet train an adult Cocker Spaniel you could be in for a very frustrating time, (because habits have been formed) unless you know what you're doing. You may have adopted an adult Cocker and his or her house-training isn't up to the mark (no pun intended!) in which case you'll need to be fairly rigorous in your approach to his training to make sure your new dog understands your house rules. It may be more difficult than house-training a puppy, but with a little patience and consistency, it can be done. Here's how to toilet train an adult dog. Giving your dog a place of his own can make all the difference to his feeling of security and can help with separation anxiety too. By giving your Cocker Spaniel training to use a dog crate you'll not only be providing him with his own safe place (where he can go for a bit of peace and quiet when things get too hectic for him). You'll also be helping with the toilet training process too because dogs don't like to foul in their own den. And it's not too late, despite what they say, you can teach an old dog new tricks, or at least you can teach an older dog to use a crate if he's never experienced one before. Crate training a dog may be a little more difficult than training a puppy to use a crate, but you CAN do it! The secret to success is lots of coaxing, plenty of treats and praise, and taking things very slowly...one step at a time. Without training, and left to their own devices, our dogs can sometimes develop annoying habits such as jumping or barking. If you don't do anything to discourage these (unwanted) attention-seeking behaviors, they can snowball into such proportions that it becomes a battle of wits to co-exist alongside our pets. Some behaviors may seem cute at first, (like your puppy jumping up for a cuddle) but when he's a fully grown adult and he's wanting your constant attention or he's jumping up at visitors, you (and your visitors) may not find it quite so cute then. Equally, we don't mind if our Cockers bark if they hear someone at the front door, but we don't want them to bark all the time. Unfortunately, if not managed, the jumping up and barking may soon be accompanied by whining, pawing, scratching, digging or chewing your favorite shoes...all aimed at getting your attention. Here's how to give your Cocker Spaniel training to stop those annoying attention seeking behaviors and teach your pet some good manners before they really get out of hand. Generally, dogs don't like being left alone. They're pack animals and are used to living, working, eating, playing and sleeping together. If they become separated from their pack, (and don't forget, in their domesticated world, you are their pack) they can often become anxious and distressed...and that's when the trouble begins. You want us to do what.....? Some dogs can handle being left alone for a while, but soon become bored and restless. When that happens, they often go looking for mischief! They try to relieve the boredom by, for example, raiding the rubbish bin or chewing the legs of your favorite chair! Separation anxiety is common in all breeds of dog, but the good news is that you can give your Cocker Spaniel training which will help him to manage better on his own and be more comfortable when you're away from the home. Like most Cockers, Max hates being left at home, but we still do from time to time because we need to live our lives. However, we always take certain precautions before we leave the house to make sure he'll be comfortable and happy while we're gone. I'm often asked questions about aggressive dog behavior by worried owners who believe their dog may be suffering from Cocker rage so I'm going to direct you to a page that talks all about it, but before you read it, please let me put the record straight. Cocker Rage is a very rare condition. Aggressive dog behavior is very often incorrectly labelled as Cocker rage syndrome. Please understand, they are not the same; there are distinct differences in the behaviors of each. If you have an aggressive Cocker Spaniel, it is highly unlikely that he's suffering from this condition...read this article about Cocker rage syndrome and see for yourself. Food aggression in dogs is an instinctive aggressive behavior, triggered by your Cocker's (often irrational) need to protect his food. If your normally docile Cocker seems anxious or growls when you approach him while he's eating, it's almost certain that he's displaying 'Food Aggression'. If it's not addressed quickly, it can lead to extremely aggressive (and dangerous) behavior, especially where children are concerned. Although it's a fairly common canine problem, and one that can begin at any time and for no apparent reason (there's always a reason, it just may not be obvious), it's a problem that should be addressed as soon as you notice the warning signs, otherwise you're in for a bumpy ride! Although there's no guarantee, there are some steps you can take to help prevent dog food aggression. If your Cocker Spaniel is already twitchy when people are near him while he's eating, here are a few suggestions on how best to handle it. This is one dog behavior problem that many pet owners find revolting, and who can blame them. Coprophagia is offensive and repulsive to us humans, but it's a fairly common practice in the dog world, especially in puppies. There are many reasons why dogs eat poop, and many simply grow out of the habit, but for those that don't here's what you can do to stop your dog indulging in this awful habit! A Tired Cocker Is A Quiet Cocker! 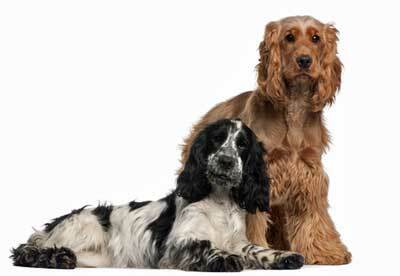 As well as setting boundaries and giving your Cocker Spaniel training, (lots of it!) there is another way in which we can help our Cockers to behave well. We all know that a tired dog is a contented (and therefore quiet and well-behaved) dog! So, how do we tire them out? Let them run around the park? Take them for a long walk through the woods? Throw sticks into the river for them to retrieve? Well, yes. These are all good activities for our pets, but it shouldn't simply end there. Physical exercise may give your dog a good old work-out and get his heart and lungs pumping, but you also need to consider giving your Cocker Spaniel's mind a workout too. You can do this by practicing his obedience training whenever you get the opportunity or by letting him work out a puzzle toy, or play a game with him, such as hide and seek. Physical and mental stimulation will help burn off all his excess energy so that your Cocker Spaniel becomes calm and relaxed and will probably be happy to snooze or lie quietly watching the family's comings and goings around him. You'll never stop your dog from doing what comes naturally, like mouthing, chewing, jumping, barking, or scavenging, (and in fairness, you probably shouldn't) but you can direct this behavior to other things that are acceptable to you. For example, if your Cocker likes to chew , replace whatever he's chewing with a safe chew bone or toy, such as a Kong. You can often prevent some behaviors with a little strategic thinking (or common sense!). However, I did find a simple solution. I now make sure the cupboard door to the re-cycling is closed tight before I leave the house...doh! If your Cocker is a (closed) door-scratcher while you're away, you may want to consider moving the bin into the garage which will allow you to leave the door cupboard door open. See, there's almost always a 'strategic' solution; Cocker Spaniel training at its best! I truly believe that we can help to influence our dog's temperament and personality by what we teach our pets and how we behave towards them. Of course, the breeder plays a large part in this, for example, by breeding from good-natured parents and/or with the quality of the initial socialization they give to their puppies, but then it's down to the eventual owner of the puppy to help shape their temperament and character. 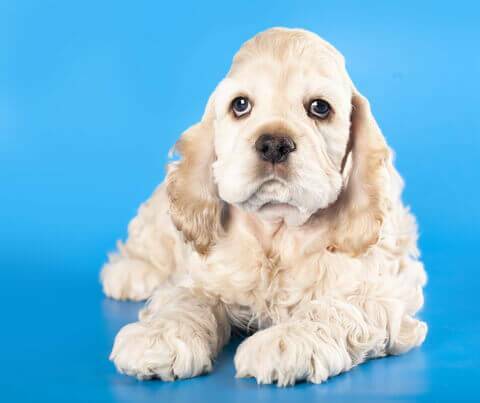 You can do this by giving your Cocker Spaniel training right from an early age and by deciding exactly how you want your puppy to behave so that you can set the appropriate guidelines and boundaries he needs to become a happy, confident, and well-adjusted adult dog!